Driving along the gently winding roads in Ireland you get the feeling you have become part of a picturesque watercolour painting. The roads make their way through the spectacular landscape with its hills and valleys enveloping the coastal beauty. Imagine Sally's Gap with its royal purple heather while it hugs a Wicklow sky of vibrant blue; the Causeway Coast the is embraced with the Glens of Antrim's gleaming emerald greens; and the gleaming Fermanagh lakes as they turn and shift and shimmer with enchanting tranquillity. Open your heart and eyes as you will fall in love with the very next scenery. From atop County Clare's wind-shaped Cliffs of Moher, you can take in the breathtaking Atlantic view along with the River Shannon graceful twists. The Irish love affair continues with the mist cover foot of County Down's Mourne Mountain. The province of Munster is made up of the counties of Waterford, Cork, Kerry, Limerick, Clare and Tipperary. Its fertile ever-changing landscapes form a microcosm of Ireland. Soaring, surf-fringed cliffs rise above tiny coves and sandy beaches. Mountains, awash with colours of rhododendrons and the delicate hues of heather, are slashed by deep gaps and scenic passes. The Knockmealdown and Comeragh range guard east Munster, while to the west the peaks of Maygillycuddy's Reeks include Ireland's highest, 3.400 foot (1.036m) Carrantouhill. The Slieve Mish range marches out to the tip of the Dingle Peninsula Ireland, and the Galtees, Slieve Felims, and Silvermines straggle across the interior. Fertile fields are ringed by stone walls and verdant woodlands. Small fishing villages along the coast and prosperous inland market towns dot the landscape. 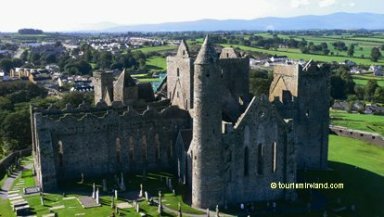 Three of Ireland's largest industrial cities and most important ports - Waterford, Cork and Limerick - ring the coastline, while inland lies the great Golden Plain of Tipperary. Leinster might well be called the "Royal Province" of Ireland. 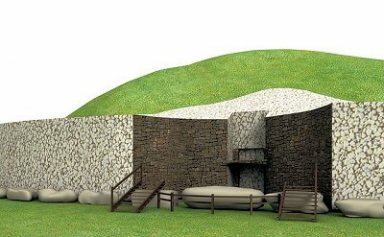 Its 12 counties have harboured rulers from the days of the prehistoric clans who constructed the great Irish burial mounds at Newgrange to the High Kings of Ireland who ruled from the Hill of Tara, from Viking and Norman conquerors, to appointees of English kings and queens. Indeed, with Irish chieftains battling against invaders and each other; it seemed best to concentrate beleaguered Crown forces in "The Pale", a heavily fortified area around Dublin. At Clontarf, juts outside Dublin, the grat Irish High King Brian Bori defeated the Vikings in 1014. In 1649, Oliver Cromwell arrived with his dreaded "Ironside" forces and proceeded to march from Dublin to Drogheda, where he slaughtered thousands of men, women and children. And in 1690, William of Orange's decisive victory at the Battle of the Boyne had a profound effect on Ireland's history that echoes down the centuries to the present day. South of Pale, County Wexford bears the scars of Viking occupation followed by Normans, who first landed in Ireland along this county's coast. Cromwell and the insurgents of 1798 left their imprint too. The lush countryside of Kilkenny lured the Normans, who dotted the landscape with castles and built a dignified town that soon rivalled Dublin as an administrative centre. Inland, Athlone stands guard over County Westmeath's rural, lake-dotted landscape and the River Shannon that divides it from Connacht. 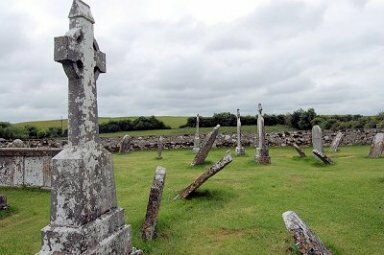 Along the banks of that great waterway in County Offaly are the remains of one of Ireland's most awe-inspiring ecclesiastical settlements, Clonmacnoise. Kildare's Hill of Allen is thought to have been the winter quarters of Fionn MacCumhail's legendary Fianna warriors, but these days the county is known for its stud farms and Curragh race course. 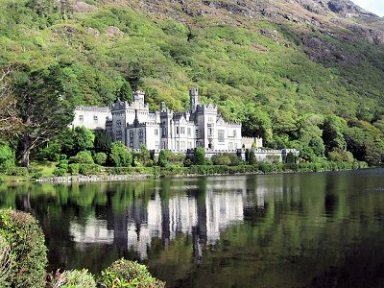 The counties that make up the province of Connacht seem to fit the popular image of Ireland more than any other region. It is a land of stony fields, brooding mountains, windswept cliffs along a rugged coastline dotted with offshore islands, and wide skies alive with the shifting light and shadow of clouds moving inland from the Atlantic. of his beloved Thoor Ballylee tower home near Gort, and Lady Gregory, the moving force behind Dublin's Abbey Theatre, gathered some of Ireland's most distinguished writers around her hearth at nearby Coole Park. In western Galway, peaks of the Twelve Pins (Bens) face the misty heights of the Maumturk range across a lake-filled valley in rock strewn Connemara, whose jagged coastline has a stark, silent beauty punctuated with rocky fields and tiny hamlets. The three Aran Islands, some 30 miles (48km) offshore, are a repository of antiquities left by prehistoric peoples and the language, customs and dress of a Celtic Twilight heritage. County Mayo holds reminders of a great prehistoric battle on the plain of Southern Moytura near Cong. Christianity came with St. Patrick, and pilgrims still follow his footsteps to the summit of Croagh Patrick on the shores of island-studded Clew Bay. 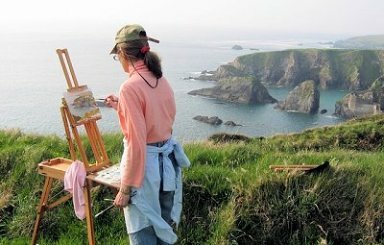 Achill Island, connected to the mainland by a bridge, is ringed by mighty cliffs and tiny coves, with a flat, boggy interior. the haunt of early Christians, who had churches and monasteries on many of its islands. Lough Key lies in a luxurious forest park, with remains of a great cloister at Boyle Abbey. Dominated by inland lakes and the River Shannon, County Leitrim has its fair share of mountains and hills. Carrick-on-Shannon, which grew up at one of the traditional fords of the Shannon, is home to a vast flotilla of cruisers for exploring the river and lakes. Liz and I were very happy overall with your service. We truly felt like VIP's on arrival. Everything went very smoothly. Thank you. We plan to arrange another trip with you to Italy for April 2016. Our trip was excellent except for the 30 hour trip home. We will certainly use your services for future trips to Europe. we have checked thorough all the vouchers and at this time they seem to all be in order. There is so much wonderful information and so on we are still going through the other file. We will take all the most relevant information out of this, thank you so much it goes beyond anything we could have done ourselves and will help make our trip much more memorable and comfortable! We will be in touch if anything come up. You put together a terrific itinerary for us. We didn't have a good idea of specific sights to see but Drive Europe selected places that fit into my general idea for our vacation. Great directions and the handbook had suggestions for sights to see, restaurant, shopping and night life recommendations. providing the service for a great trip for both me and my wife.